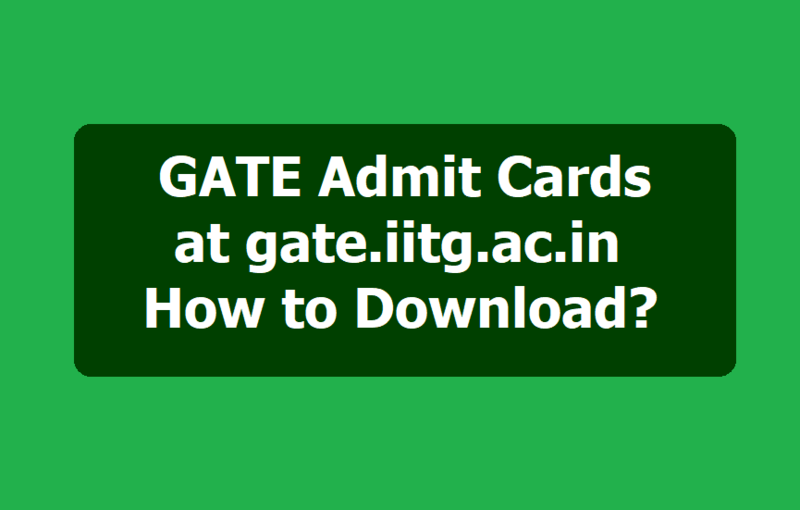 GATE Admit Cards 2019 download/GATE Admit Cards 2019 at gate.iitg.ac.in, How to download? GATE Exam Schedule 2019: The admit cards for the Graduate Aptitude Test in Engineering (GATE) 2019 has been released on January 4, 2019, according to the official website. Candidates can download the admit cards from the official website, the link for which is gate.iitg.ac.in. Graduate Aptitude Test in Engineering (GATE) is an examination on the comprehensive understanding of the candidates in various undergraduate subjects in Engineering/ Technology/ Architecture and post-graduate level subjects in Science. GATE is administered jointly by the Indian Institute of Science (IISc), Bangalore and seven Indian Institutes of Technology (namely, IITs at Bombay, Delhi, Guwahati, Kanpur,Kharagpur, Madras and Roorkee). GATE 2019 admit card released @ gate.iitm.ac.in: Indian Institute of Technology, Madras (IIT Madras) has released the Graduate Aptitude Test in Engineering (GATE) 2019 Admit Card today i.e., January 4, 2019. The Adimt Card is now available on GATE Online Application Processing System (GOAPS) website (https://appsgate.iitm.ac.in/) for printing. GATE is a national level engineering entrance examination conducted jointly by the Indian Institute of Science and seven IITs. The GATE 2019 Admit Card can only be downloaded from the GOAPS website from January 4, 2019. Candidates should note that the Admit Cards will not be sent by post or as e-mail. The candidate are suggested to appear at the GATE Examination Centre on the date and time specified in the Admit Card. Candidates must bring a print-out of the downloaded Admit Card to the Examination for the verification along with the original and valid photo Identity Document like Passport, PAN card, Voter ID, Aadhaar-UID, College ID, Employee ID and Driving License - issued by the competent authority. For International candidates, only a valid Passport/Government issued ID/College ID/Employee ID will be accepted as the recognized identification. The Admit Card is valid if and only if the candidate's photograph and signature images are clear and legible. The photograph on the Admit Card and that in the valid photo identity document should match with the appearance of the candidate on the day of examination. GATE 2019 Admit Cards are available on 4th January 2019, this week, on the official website of Graduate Aptitude Test in Engineering - GATE 2019 - gate.iitg.ac.in/. The notification pertaining to the same on the web portal read, “Admit Card will be available in the Online Application Portal (for printing) - Friday - 04th January 2019.” GATE 2019 is scheduled to be conducted across the country on 2, 3, 9, 10 February 2019, next month, in two sessions viz forenoon from 9 am to 12 noon and afternoon from 2 pm to 5 pm. Steps to download GATE Admit Card 2019: Log on to the official website, gate.iitg.ac.in; Click on relevant link; Enter all the required details in the prescribed format; Click to submit; Admit cards will be displayed on the screen; Download and take print out of the same for future use. Note: Candidates must note that no printed copy of the admit cards will be posted to the candidates. The exams are scheduled on February 2, February 2, February 9, and February 10. The exam will be conducted online. Examination schedule: GATE 2019 examinations for 23 papers will be conducted across eight sessions from February 2, 2019 to February 10, 2019. The examination will be held in two shifts -- forenoon 9 am to 12 pm and in afternoon 2 pm to 5 pm. About GATE 2019: As per the official website, the following is the detailed information about GATE 2019. Graduate Aptitude Test in Engineering (GATE) is an examination on the comprehensive understanding of the candidates in various undergraduate subjects in Engineering/Technology/Architecture and post-graduate level subjects in Science. GATE is administered jointly by the Indian Institute of Science (IISc), Bangalore and seven Indian Institutes of Technology (namely, IITs at Bombay, Delhi, Guwahati, Kanpur,Kharagpur, Madras and Roorkee). GATE 2019 start from 02-02-2019: 5 important dos and don'ts for candidates: The Graduate Aptitude Test in Engineering (GATE) 2019 is scheduled to be held tomorrow, that is February 3. Thousands of applicants are expected to take the exam. Indian Institute of Technology (IIT) Guwahati is the official organiser of GATE 2019. The exam will start at 9 am on Sunday at different examination centres, as per the official schedule. The examination is being conducted for admission to master's and direct doctoral programmes in engineering, technology, architecture as well as in other branches of science at institutes such as the IITs and the Indian Institute of Science. Examinations will be held on 2, 3, 9 and 10 February 2019. The three-hour-long examination will require candidates to answer 65 questions, worth a total of 100 marks. The paper will be divided into two sections, with questions based on general aptitude for 15 marks, engineering mathematics for 10 to 13 marks and core engineering area of the candidate. Candidates appearing for GATE 2019 should keep a note of a few dos and don'ts before they sit for the exam. Don't forget your admit card: Make sure you are carrying the hard copy of your admit card and a photo identification document with you at the examination centre. Candidates with just a soft copy of the admit card in the cell phone won't be permitted to appear for the exams. No electronic items: Candidates will not be allowed to carry their mobile phones or other electronic items inside the examination hall. A recent official notification clarified, 'If a candidate brings personal belongings including mobile phones, they have to be kept outside the examination hall at the candidate's own risk. The GATE officials are not responsible for safe keeping of your personal items.' However, a virtual scientific calculator will be provided to the candidates. Magnified question paper for visually challenged students: Examination centres can provide a magnified question paper for those students who are visually challenged. Concerned candidates are expected to contact the GATE Institute Representative through the invigilator regarding this matter. Don't panic: A day before the examination, try to relax and stay positive and do not tire yourself with frantic last minute revisions. On the last day of the preparations, do not attempt to study the entire syllabus and only go through portions that you deem are important. Try to maintain a positive attitude and indulge in activities that relax and calm you. Reach examination centre on time: In order to avoid any last-minute confusion and stress, reach the examination centre well before the scheduled time. Also, make sure to double check the address of the venue so as to avoid any unnecessary delay.